Gene Link is the leader in triple repeat disorder genotyping using non-radioactive based methods. We have more than a decade of expertise and have developed facile non-radioactive detection methods for safe, sensitive and reliable genotyping of human genetic disorders. Take a look at the simple agarose and polyacrylamide gel based systems, the chemiluminescent Southern blot detection methods and the fluorescent systems for genotyping of triple repeat disorders. Our present understanding of the molecular basis of genetic disorders is principally due to the continued molecular genetic and clinical advances in recombinant DNA techniques. These new information improves our understanding of simple mutations as well as complex genetic mechanisms as causes of disease. The molecular basis of genetic disorders is as varied as clinical genetics itself. The molecular etiology of disorders may be fundamentally straightforward, such as in sickle cell disease, which is the best understood and the first disease whose mutation was established at the DNA level; where as now, molecular genetics has delineated a whole new class of disease where anticipation is involved; that is, the phenomenon of apparently increasing disease severity in successive generations. Addressing the etiology and molecular diagnosis of the more complex disorders that involve anticipation (e.g., Fragile X Syndrome, Myotonic Dystrophy, and Huntington�s disease) is often challenging. The choice of using methods for mutation analysis is restricted by our knowledge of the existence of a mutation and its type and in parallel to the development of safe and sensitive new detection methods. Gene Link&apos;s primary focus is in the development of facile non-radioactive detection methods. This product profile of Gene Link&apos;s current gene detection product line spotlights chemiluminescent, fluorescent detection products as well as conventional radioactive based methods for genotyping the challenging triple repeat disorders as well as single base mutations and various pathogens. 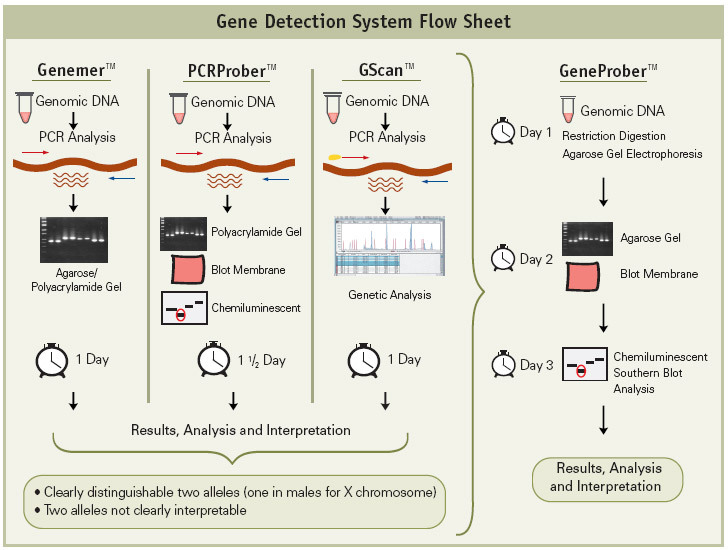 Gene Link&apos;s gene detection systems product line is divided into four broad groups based on detection methods. The GenemerTM product line is PCR based. The product includes a specific primer pair for gene or mutation specific amplification. Genemer products are available for the gene fragment and disorders listed. Specialized optimized conditions may be required for certain triple repeat disorder amplifications. The GenemerTM kit is a complete easy-to-use kit for reliable genotyping of a gene fragment. The product includes a specific primer pair for gene or mutation specific amplification, optimized buffers and dNTPs and in most cases, control DNA. These kits contain specialized and optimized conditions that are required for amplification of large repeats in certain triple repeat disorder amplifications. Gene Link recommends these GenemerTM kits for researchers who have not established their own optimized amplification conditions. GenemerTM kits are also available for conventional radioactive-based detection methods. A Radioactive component is not present in these kits. Gene Link strongly recommends the use of non-radioactive gene detection systems. Consider switching to Gene Link&apos;s product line of non-radioactive detection systems. The GeneProberTM product line is based on the chemiluminescent Southern blot detection method. Gene Link&apos;s non-radioactive detection systems for genotyping of triple repeat disorders are rapid, reliable and as sensitive as the 32P labeled southern blots. No more decayed probes and radioactive exposure. Kits are available for reliable genotyping of the fragile X, myotonic dystrophy and other triple repeat mutation group disorders. Unlabeled GeneProberTM probes are also available for radio labeling and radioactive based detection. Gene Link strongly recommends the use of non-radioactive gene detection systems. Consider switching to Gene Link&apos;s product line of non-radioactive detection systems. Gene Link&apos;s GScanTM gene detection kits are safe, convenient and sensitive, and afford automated compilation of data. The kits contain optimized PCR amplification reagents and a wide array of fluorescent-labeled primers for genotyping after PCR using fluorescent genetic analyzer instrument(s). Included in these kits are ready-to-run control samples of various repeats of the triple repeat disorder kit. These control samples are for calibration with the molecular weight markers for accurate size determination of the amplified fragments. The GScan kits are simple and robust for routine triple-repeat detection of greater than 100 repeats of all triple repeat disorders listed, except Fragile X. The CGG repeat in Fragile X can be detected up to ~50 repeats. These are cloned fragment of the mutation region of a particular gene for use with gene or mutation specific Genemer? and GScanTM products. These control DNAs are ideal genotyping templates for optimizing and performing control amplification with unknown DNA.